May 30, 2012 -- Radiation dose to patients from medical exposure continues to rise, particularly with increased use of CT scanning and nuclear medicine. The American College of Radiology (ACR) has written a white paper on the issue, and the European Commission (EC) also is interested in the topic. The EC issued a proposal in 2011, and a decision is expected this year, followed by new legislation in 2014. 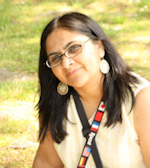 Dr. Neelam Dugar is a consultant radiologist at Doncaster Royal Infirmary, U.K., and chair of the Royal College of Radiologists' Imaging Informatics Group. Traditionally, radiation dose from x-ray, CT, and fluoroscopy/angiography were read on imaging devices, then manually recorded by the radiographer or technician in the RIS. It is well recognized that manual data entry can result in errors, which can skew the results, but this practice remains common in most parts of the world. With the implementation of PACS and the widespread adoption of DICOM standards by PACS vendors and equipment manufacturers, there is no longer a need for manual recording of radiation dose information. Most of the new devices (computed radiography, digital radiography, fluoro/angio, CT, etc.) are able to output the radiation dose information in a standard DICOM format -- RDSR, or radiation dose structured report. Devices/imaging modalities output radiation to create images. Radiation dose information is recorded by these devices for a long time. REM requires the imaging devices (modalities) to record this in a standardized manner -- DICOM RDSR. REM also requires them to send this DICOM RDSR information to PACS, along with images. PACS receives and stores images from modalities/devices in DICOM format. REM expects PACS to receive and store RDSR information. As customers, radiology departments should insist on REM profile adoption in imaging devices within their replacement project for modalities and PACS. When a country or region acquires a national registry, departments will then simply be able to output the information very easily. Hospitals will be required to plug in dose information reporter software to their PACS to enable them to send standardized dose information to the national registry. Therefore, the overall advice to hospitals for future proof of their investment is that any devices/modalities replaced or bought must support IHE's REM profile as an acquisition modality actor. Any PACS bought must support the REM profile as image manager/image archive actor. 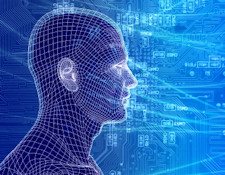 Vendor-neutral archiving (VNA) concepts are moving from speculation to reality. The definition of VNA is achieving clarity as well, in terms of single-department and multidepartment DICOM VNA and multidepartment cross-document sharing (XDS)-based VNA for DICOM and non-DICOM content (CDA/encapsulated PDF, etc.). If a customer is planning to buy a VNA as part of a PACS replacement project, it is important that the VNA can support the REM profile. It may be better for a hospital using a multidepartment DICOM VNA to connect its VNA to a dose information reporter software to output dose information to the national registry, rather than relying on each individual departmental PACS. As for decision support for referring doctors, it is important that radiation dose is simply a background database information feature. To educate radiographers, radiologists, and referring doctors about radiation dose, this radiation dose information must be explicitly displayed for the users to see. The standard radiation dose information must be displayed, along with the acquired images, on the PACS display. For example, this will allow users to see when a patient has had a chest x-ray that is followed by a CT scan, and it will show the difference in radiation between the two procedures for the same patient. When the same patient needs a follow-up image, the referring doctor can make a judgment about whether the extra radiation for CT is justified. Efficiency gains for radiographers. There are going to be huge efficiency gains for departments if they do not need to manually record radiation dose. In medium-sized departments producing approximately 350,000 examinations per year, even if it were possible to make a one-minute saving per examination, about 5,800 hours of staff time would be saved per year. Decision support for referring doctors. Access to radiation dose information at the time of making a referral will help support patient-centric decision-making on the need for a follow-up test. Better population information. National registries will allow good comparative data for radiation trends and also identify outliers -- hospital, devices, etc. -- that are emitting higher radiation for similar procedures -- so as to apply a remedy. Nilsson M. Role of PACS in radiation dose monitoring: Six years experience from clinical use of an automatic dose monitoring system. Presentation given at Spring UK Imaging Informatics Group Meeting, 27 April 2012, British Institute of Radiology, London. Click here to access PDF file. Clunie D. Automated recording of radiation dose from modalities. Presentation given at Spring UK Imaging Informatics Group Meeting, 27 April 2012, British Institute of Radiology, London. Click here to access PDF file. Radiation exposure monitoring. IHE Wiki website. 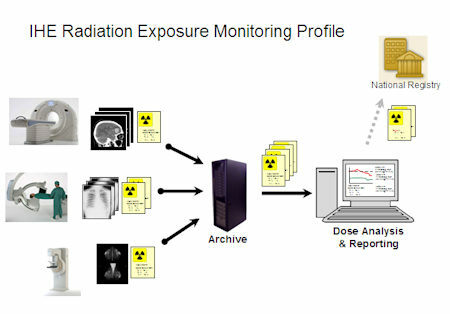 http://wiki.ihe.net/index.php?title=Radiation_Exposure_Monitoring. Dr. Neelam Dugar is consultant radiologist at Doncaster Royal Infirmary, U.K., and chair of the Royal College of Radiologists' Imaging Informatics Group.